Me Auriga’s mainboard is the updated version of Orion and is equipped with multiple onboard sensors for temperature, sound intensity, a gyroscope, a buzzer driver; features a one-key power switch, wireless Bluetooth control and firmware upgrade capability, the original two red ports have been updated to four ports with the same functions; PORT5 is isolated only with serial communication function, so it cannot be used to update a program but only for communication. It is also compatible with USB serial port. PORT6 to PORT10 are compatible with dual-digital, simulation, 12C bus, unibus, and simulate serial port. Me Auriga has an encoder motor port, smart servo port and LED Ring Light Panel port (with power switch). The size of PCB is also enlarged. Can drive two encoder motors and support over-current protection for 4A (instant). Supports Bluetooth and Bluetooth wireless upgrade firmware. One-key power switch to control the whole circuit. Onboard gyroscope, sound sensor, passive buzzer and temperature sensor. PORT5 – PORT10 have short-circuit protection and over-current protection for 3A. PORT1 – PORT4 have short-circuit protection and over-current protection for 3.5A. USB port with antistatic protection. Compatible with RJ25 network port. Provides a dedicated library compatible with Arduino, a user-friendly interface which is powerful and easy to understand. The sound sensor on Me Auriga is designed to detect the intensity of sound in the surrounding environment. The sound sensor is based on the microphone. Its main component is an LM2904 low-power amplifier. It can be used in interactive projects, such as a voice-activated switch, or a robot that follows dance movements. Me Auriga has an onboard gyroscope sensor. It is an ideal motion detection and posture detection module for robot, including a 3-axis accelerometer, 3-axis angular velocity sensor and a motion processor. It can be applied to a self-balancing robot or other mobile devices. Me Auriga has an onboard thermistor that can be used to detect ambient temperature changes. Arduino is an open source electronic prototyping platform with flexible and easy-to-use hardware and software. The software section contains the Arduino development environment (IDE) and core libraries. The IDE is written in Java and is based on the Processing development environment. Me Auriga is compatible with the Arduino Mega 2560, so you can use the Arduino IDE to develop your program. 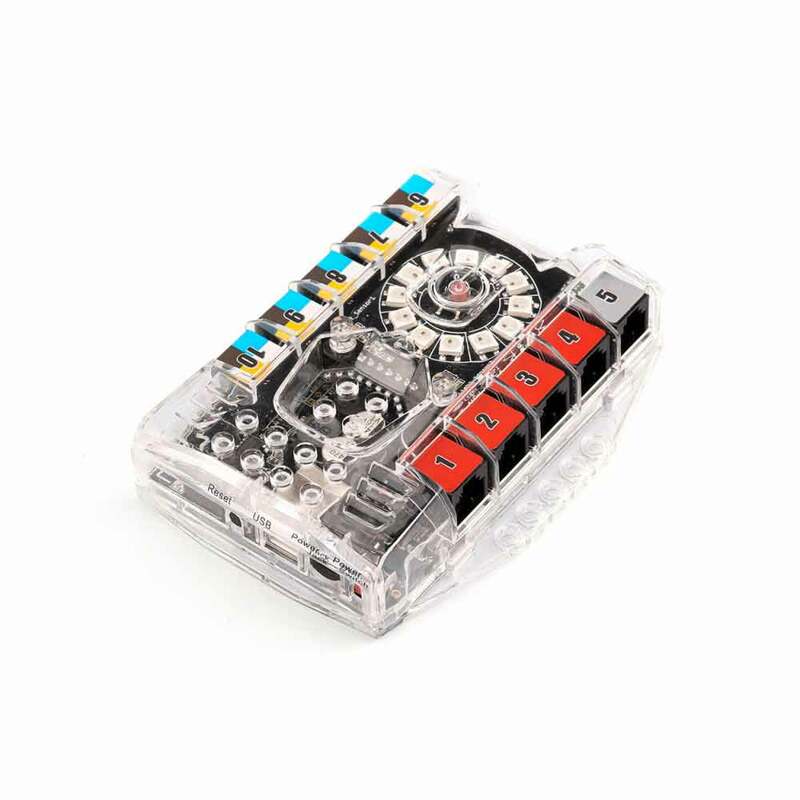 If you use the Makeblock electronic module, we recommend that you install the Makeblock library. Me Auriga supports mBlock programming. mBlock is a programming software most suitable for beginners, which inherited the simple, easy to use characteristics of Scratch, and is integrated with the powerful scalability of Arduino. Control support and program uploads are available online. Simply drag over the mBlock code – it’s as easy as playing with drag-and-drop blocks. At the same time, it will help beginners transit smoothly to genuine programming language. Me Auriga uses 6-12V DC voltage. Prevent contamination from water, acidic/alkaline liquids or solids.